Author Nicola Griffith begins her Light of the World Trilogy with Hild, a novel set in seventeenth-century Britain that follows a young girl as she ventures through the dangerous world of Edwin, King of Northumbria. As her abilities to predict the future grow she becomes both a valuable asset and a powerful weapon. When did you first hear of the true-life character of Hild and did you instantly want to write about her? I was in my early twenties, living what mostly felt like a good life, but could occasionally be very hard, in Hull. And one day I felt overstretched–like butter scraped too thin over bread, as Tolkien might say–and just had to get away. I hiked north, up the Yorkshire coast, and came to Whitby and the great gothic ruins of the abbey on top of the cliff. Stepping over the threshold of that ruin changed my life. Turned me inside out like a sock. It’s difficult to describe it. I’d always been interested in history, always played What If, always loved the ruined places of the past. But that time, that place… It wrenched my world off its axis. History became real. Looking back now I realise it wasn’t long after that that I started to write. I was writing about the future then–science fiction–but it’s all connected*. Anyway, that’s where I first became aware of Hild–or St Hilda, the woman who founded the abbey and in 664 CE hosted and facilitated the famous Synod in which Roman Christianity, not the Celtic flavour from Ionia, won the day. It changed the course of history. But who was Hild? All I could find was a brief mention in the Venerable Bede’s History of the English Church and People. She trained five bishops. She was present, responsible in some ways, for the creation of the very first written Old English poem. She was a counsellor to princes and kings and is revered even now, fourteen hundred years later, as a patron saint of culture and learning. But there were no biographies, no hagiographies, no scholarly anthologies. Nothing. I had no idea how a woman in what used to be called the Dark Ages, a woman born in an illiterate culture where kings were petty warlords and might be right, ended up midwiving English literature and changing the world. The more I learnt over the years about how impossible that was, the more I wanted to know how she did it. I wrote this book to find out. Being the first in a trilogy have you already got in mind how the series will come to an end? I know the last line of the last book. I’ve known it since I got about a third of the way through the first. But just because I know the endpoint doesn’t mean I know exactly how I’ll get there. I’m hoping there will only be three! Having said that, there are some points in her life we do know from history–and I’ll use one of them to end the second novel. Do you have any strict writing regimes that help you hit your targets? No. There are weeks at a time when I don’t write fiction: I research, I write to academics, I write essays, I think. But when I’m really rocking and rolling on a novel I work hard, I’m focused. I know what scene or scenes I want to write that day and I write them; which means some days are longer, some days more difficult, than others. But I love to write, absolutely love it. When it’s going well, there’s nothing else like it in the world. Hild has received some incredible reviews from historians, fantasy authors, crime authors and many others, have you received anything that’s astounded you more than others? Have you been able to do any other writing while penning the Hild series or is it easier to concentrate on one storyline? Female leads in historical novels are quite unusual unless they are queens or princesses, do you think it’s important to highlight women’s roles in this period of time? Most of the women–and men–we’ve heard about mattered in their day. Royals have always been seen as more important than hoi polloi. As writers, our interest is generally snagged by what we read, and historians have always chronicled those regarded as important, even if it was just because they paid the chronicler’s keep. We know that in some eras royal women had more agency than commoners, more freedom of movement and more power. It’s more interesting, frankly, to write about people who do rather than those who are done to. Also, if someone like Hild was possible in the past, she’s possible now. If you change what we see as possible, we change what might be possible in the future. We change the world. If you could describe Hild in five words, what would they be? Extraordinary. Stubborn. Alive. Imperfect. Human. * At the most fundamental level, I write to explore the world, to find out. Sometimes to change the world. It doesn’t matter to me if it’s the future (Ammonite, Slow River), the present (The Blue Place, Stay, Always) or the past (Hild). 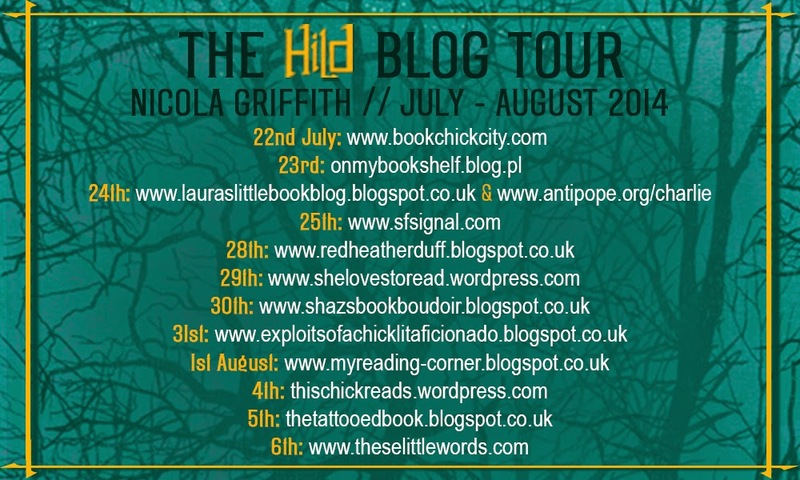 Buy Hild by Nicola Griffith from Amazon here.